While Jesus was teaching [the lesson of new wine in old skins], an official came to him and bowed before him, saying, "My daughter has just died; but come and lay your hand upon her, and she will live." Jesus arose and followed him, as did his disciples. On their way, a woman, who had suffered from bleeding for twelve years, came up behind him and touched the hem of his robe; for she said to herself, "If I just touch his clothng, I will be cured." But Jesus turned and, seeing her, said, "Daughter, take heart; your faith has healed you." And the woman was healed. When Jesus came to the official's house and saw flute players and a crowd of noisy guests, he said, "Make way. This girl is not dead, but asleep." And they jeered and laughed at him. But when the crowd had been sent outside, he entered, and took her by the hand; and the girl arose. And the news of the event spread throughout the area. The illness of the woman who is healed by touching Christ's robe is described vaguely. One might speculate that it was a gynecological problem, a relatively common cause of chronic hemorrhage without other (more serious) symptoms; the era's sensibility and medical ignorance would likely cause such a problem to be described simply as a "flow of blood" . 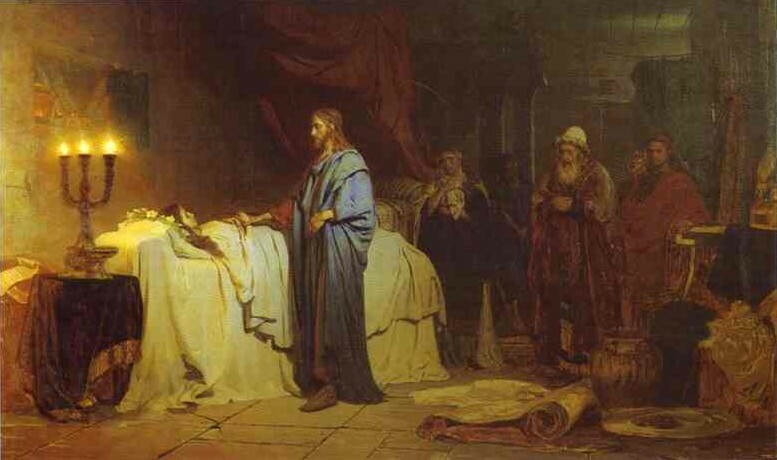 "Christ Raising Jairus' Daughter (Ilya Repin, 1871). Repin was a Ukrainian icon painter who gave the subject a bit of a Russian flavor. This is apparently a popular subject with artists; a lovely modern treatment of the story was done by Ong Wilson in 1996; it can be seen on Mr. Wilson's website.